When the Florentine navigator Giovanni da Verrazano first saw the Lenape along the east coast in 1524 he wrote, "These people are the most beautiful and have the most civil customs that we have found on this voyage. They are taller than we are, they are a bronze color, some tending more towards whiteness, others to a tawny color; the face is clean-cut, the hair is long, and their manner is sweet and gentle, very like that of the ancients. They have all the proportions belonging to any well built men. Their women are just as shapely and beautiful; very gracious, of attractive manner and pleasant appearance." 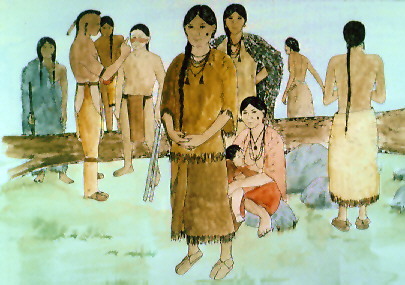 The clothing of the Lenape was simple. The men wore breechclouts and moccasins, with leggings and a robe to cover themselves in cold weather. Women had knee- or calf- length wrap-around skirts and wore fur robes in winter, or a beautiful mantle made from turkey feathers. Ornaments of bone, shell and wampum were sometimes worn as necklaces, or on wrists and ankles.